Lemolo Falls is both the tallest and most powerful waterfall along the North Umpqua River. Here the river breaks over a contorted cliff of columnar basalt and plummets 165 feet into a large pool. The falls have been described as a raucous monster - its name even adding to that reputation - yet Lemolo Falls is actually one of the most consistent waterfalls in Oregon. The Lemolo Lake Dam a few mile upstream draws off the vast majority of the North Umpqua River but allows a fixed amount of water to flow over the falls at all times. Lemolo Falls Trail is a 3.2 mile moderately trafficked out and back trail located near Idleyld Park, Oregon that features a waterfall and is rated as moderate. The trail is primarily used for hiking, walking, nature trips, and birding and is best used from June until September. Dogs are also able to use this trail but must be kept on leash. 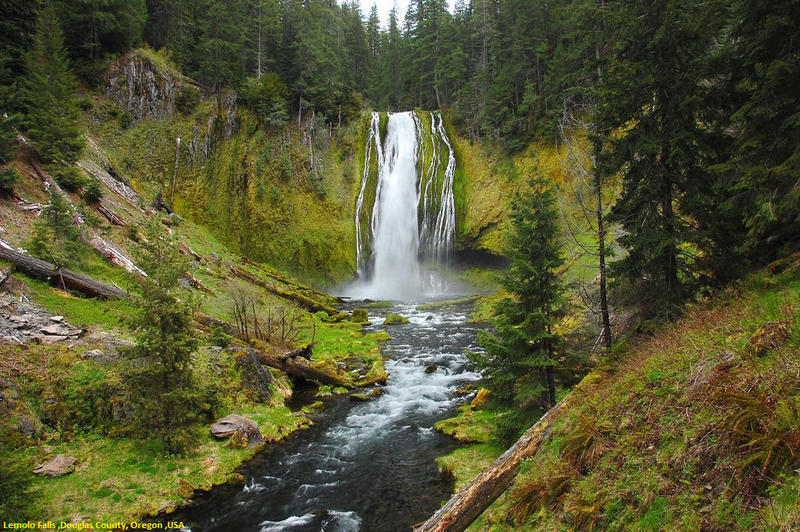 Lemolo Falls is located near Lemolo and Diamond Lakes in the Umpqua National Forest. Depart Highway 138 eleven miles east of Toketee at FR 2610, marked for Lemolo Lake. Follow Road 2610 for 4 1/4 miles and turn left onto Thorn Prairie Road # 3401. Follow 3401 for 1/2 mile to Road 3401-800 (a small sign reads just "800"), and a sign pointing towards Lemolo Falls. Follow 800 for 1 3/4 miles to road # 3401-840 (again, signed just "840"), also marked for Lemolo Falls. Proceed to this road's end in 1/4 mile. Lemolo Falls trail # 1468 takes off downhill, following part of an old road to the old trailhead and picnic area in 1/3 mile. The falls are reached 1 mile from the trailhead.